Designed for thick sandwiches, this knife is made to cut easily and quickly through a variety of sandwich ingredients. The Deli Knife is manufactured with carbon steel, offset blade allowing for ease of slicing and handling, as the offset keeps the hand holding the knife, up and away from cutting boards or counters as the blade is pushed downward through thicker than average sandwiches. The offset makes the knife handling easier to control and better positioned as the full length of the blade can be positioned so it is horizontally parallel with the cutting surface. Deli knives are available in several different lengths, the most common being 8 inches. 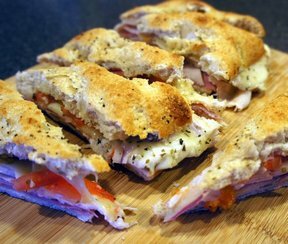 Since the blade contains a slight serration, it easily releases resistance as it cuts through foods, resulting in less food being pulled out and away from the thicker, deli-style sandwiches.